I’m a sometimes golfer…work and children keep me too busy to spend very much time with a golf club in my hands. Being married to a golf pro, though, I know my way around a bit. So whenever I show a home on a golf course, the first thing I do is go look out the back window. Nope, I ‘m not checking out the view (well, I am, a little.) I’m looking to see where the house is positioned relative to the hole that it’s on. If the house is midway up the fairway, it’s time to have a discussion with my buyers. Listen close: a house that is built halfway up the fairway, in all likelihood, is going to get peppered with golf balls. The frequency of how often you end up with a ball in your backyard (or front yard, honestly) is a function of whether it’s a public course that has a ton of play, a private club with a small membership, or something in between. A home built with a view of the green may be safe, or it may be right in the firing line. If your agent doesn’t know golf well enough to know, and you like the house, enlist the help of a friend (or one of the golf course staff) to give you their opinion. Go outside and look at the back of the house. Are their trees or deck screens to provide shelter from stray shots? Are their dings in the siding of the house, dents in the gutters? If the owners are there, have your agent ask how many broken windows they have had while owning the house. Look at the next door neighbors’ homes…the home for sale may have fixed all their damaged siding, but the neighbors’ houses could show you more. While the view is beautiful and peaceful, that lovely location can impact how you can or can’t use your backyard space. There are products available including high impact siding or shatter resistant windows, and your homeowners’ insurance should cover any damage. Please know that when a shot goes awry and damages your home, it is the responsibility of the golfer to leave their contact information with you and work it out. The golf course isn’t liable for the actions of the golfers; the golfer assumes the responsibility for their shots at the time that they step up to the first tee. Keep in mind that not all homes on a course are in a position to have errant shots hit the house or land in the yard. 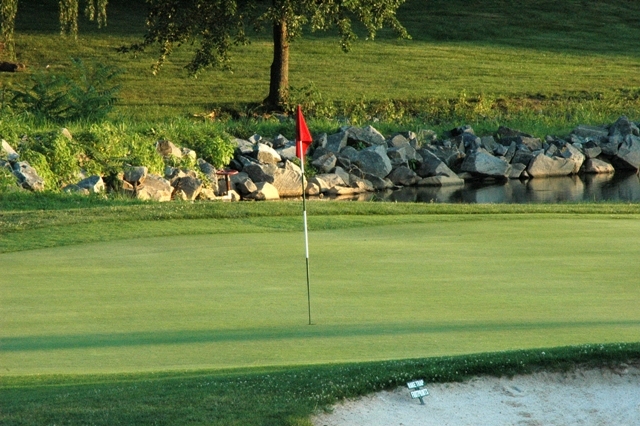 The beautiful views of a well maintained golf course can help safeguard the value of your home. However, I’m amazed at how many golf community homeowners I’ve talked to who tell me their agent either didn’t inform them of implications of living on a course, or outright lied and said they wouldn’t have any balls in their backyard. As you would with any house, do your due diligence, ask questions, and find out before you purchase the house. Then you can enjoy the peaceful view without regret.